The Jeep Grand Cherokee and GMC Acadia are two midsize suvs that get high marks. Yet, at the same time, they are very different. The Grand Cherokee deserves praise for its off-road prowess. The Acadia has mild off-road chops and is primarily regarded as an on-road people-hauler. 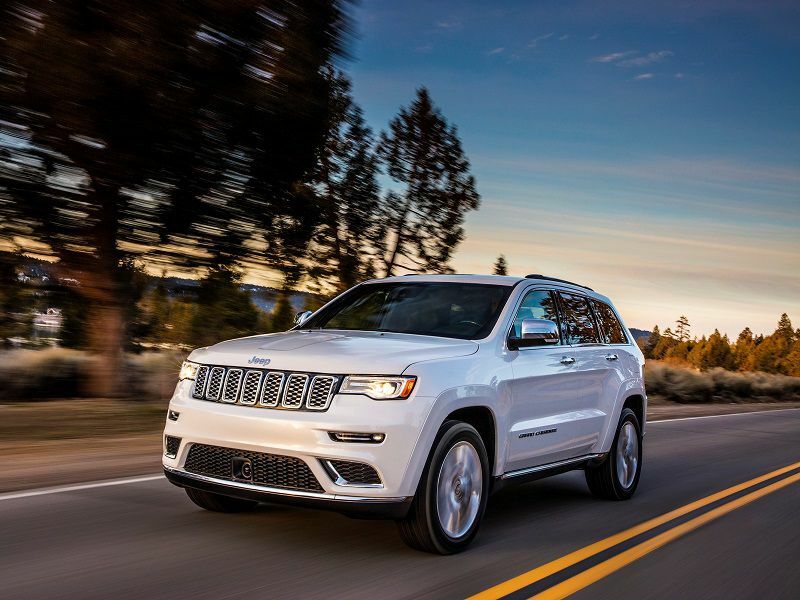 The Grand Cherokee has been a leader in the segment for decades by bringing a sense of luxury and style — plus the Jeep name — to what had been a purely functional segment. There is a premium aspect to the Grand Cherokee that the GMC Acadia also is trying to capture. In addition to versatility, safety, interior room — aspects you expect in most SUVs — both the Acadia and Grand Cherokee offer attractive interiors that could feel right at home in a luxury sedan. 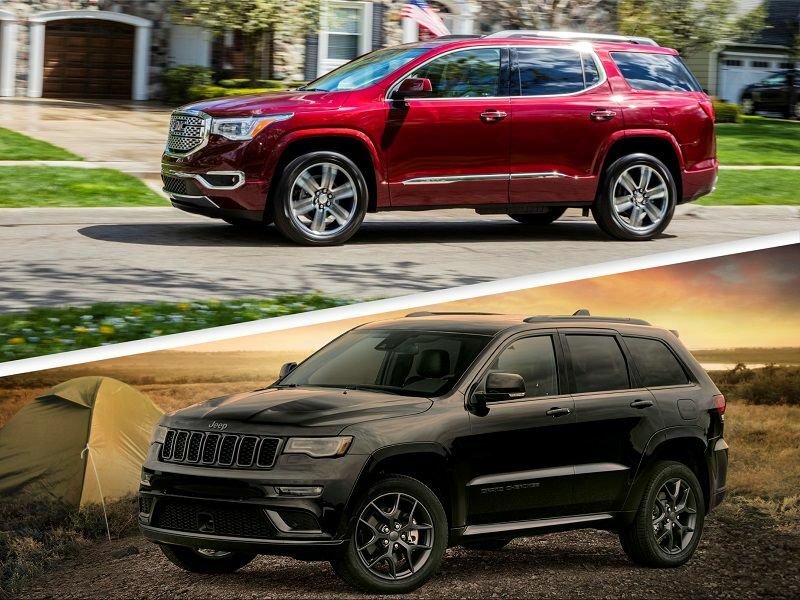 Let's take a look at which is best, the 2019 Jeep Grand Cherokee or 2019 GMC Acadia. The Grand Cherokee offers engines that range from the mild to the proverbial wild. 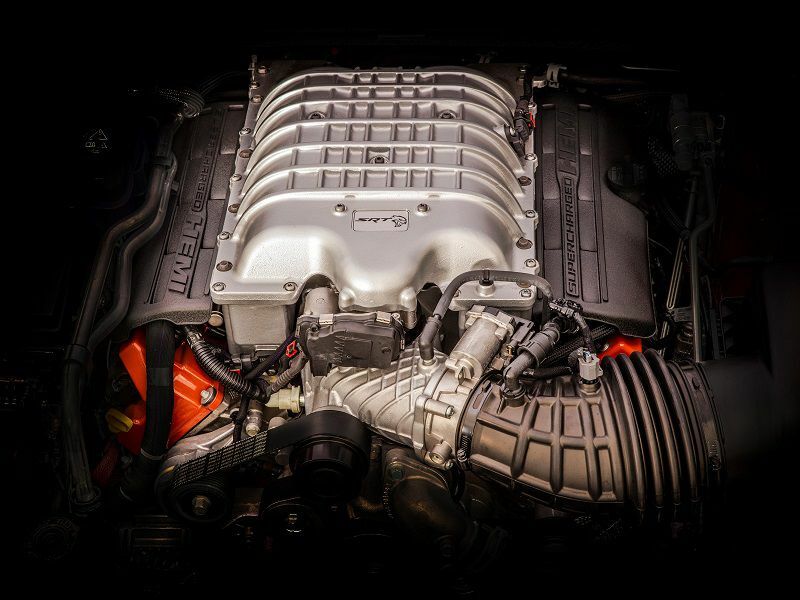 The base engine is the time-proven Pentastar 3.6-liter V6, which is rated up to 295 hp. The available 5.7-liter V8 delivers 360 hp, and while that is stout, things get even more radical from there. 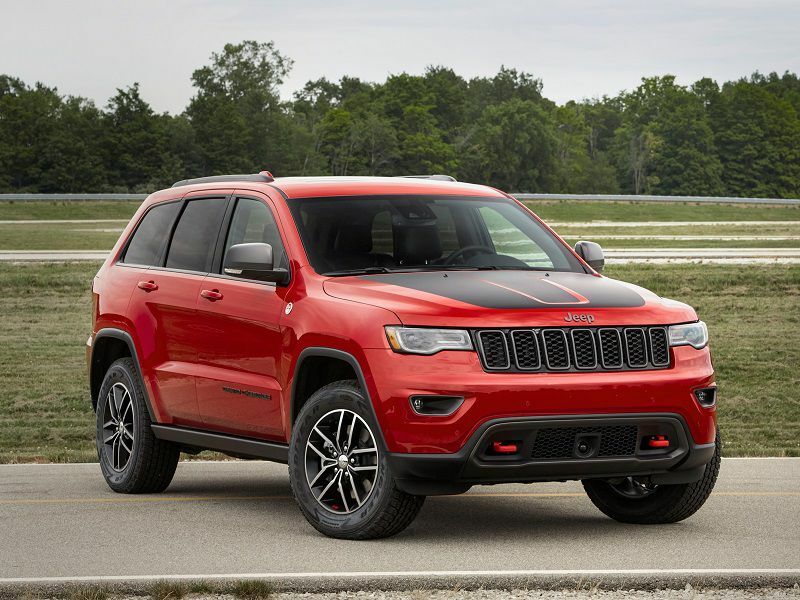 The Grand Cherokee SRT features a 475-hp 6.4-liter V8 with Fuel Saver Technology that delivers sports sedan-like performance, and the Grand Cherokee Trackhawk, which FCA claims is the most powerful and quickest SUV ever, has a 707-hp (yes, really) 6.2-liter supercharged V8 engine. The Acadia’s engine choices pale in comparison: the 2.5-liter DOHC in-line four-cylinder delivers 193 hp, and the 3.6-liter DOHC V6 brings 310 hp. Both the Acadia and Grand Cherokee are among the best-looking in the segment. Through several generations, Jeep stylists have done a good job on the Grand Cherokee’s design, retaining the Jeep ruggedness while also giving it a prestigious lilt. The seven-slot grille immediately identifies the Grand Cherokee as a Jeep, and off-road-influenced approach and departure angles look aggressive and contribute to the Grand Cherokee’s capabilities. At the same time, the Grand Cherokee’s essential "Jeepness" means it isn’t as large or commodious as some of its competitors. The GMC Acadia also is a good-looking vehicle, though it lacks the Jeep’s distinctiveness. At 193.6 inches in overall length, it is almost four inches longer than the Grand Cherokee, but it is marginally narrower. The GMC Acadia boasts a well-designed interior that holds no surprises, and that’s a good thing. The overall look is decidedly upscale, and the Acadia could substitute for a luxury-brand SUV. The front seats adjust in a multitude of directions and are comfortable for the long haul. Three rows of seating, including second-row captain’s chairs or a split-folding bench, offer flexibility, and the curbside seat has sliding and tilt-forward capability. The 50/50-split third-row seat isn’t especially big, but it folds flat. The Grand Cherokee’s interior reflects an international luxury-car aesthetic. It makes it clear you are in a Jeep, but the gritty interior some Jeeps boast has been softened, lending itself well for the suburban kid-shuttling for which it often will be used. It doesn’t offer a third row of seats. 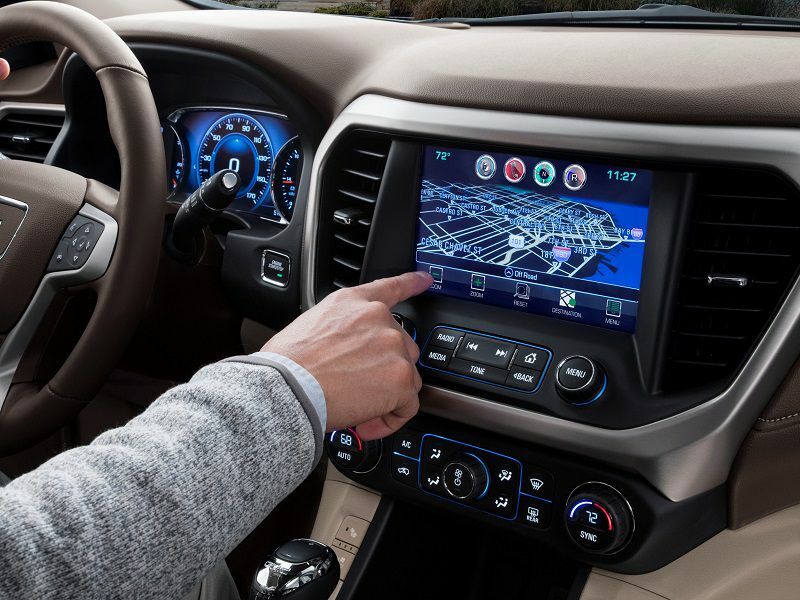 The 2019 Grand Cherokee models are equipped with standard Apple CarPlay and Android Auto, delivered through the latest version of the Uconnect 8.4-inch touchscreen. 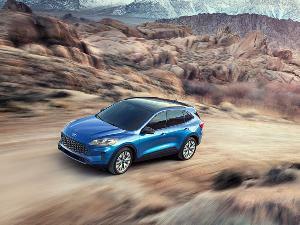 The radio and navigation system has bonded glass and pinch-and-zoom capability. The 7-inch multi-view instrument display cluster is configurable. While we are big fans of the Jeep’s Uconnect system, the Acadia’s infotainment system is equally intuitive. It, too, uses big, colorful icons to identify the various functions, so it won’t take you long to feel right at home using the many functions it offers. A 7-inch color touchscreen is standard, and an 8-inch system with navigation is available. Both integrate Apple CarPlay and Android Auto. 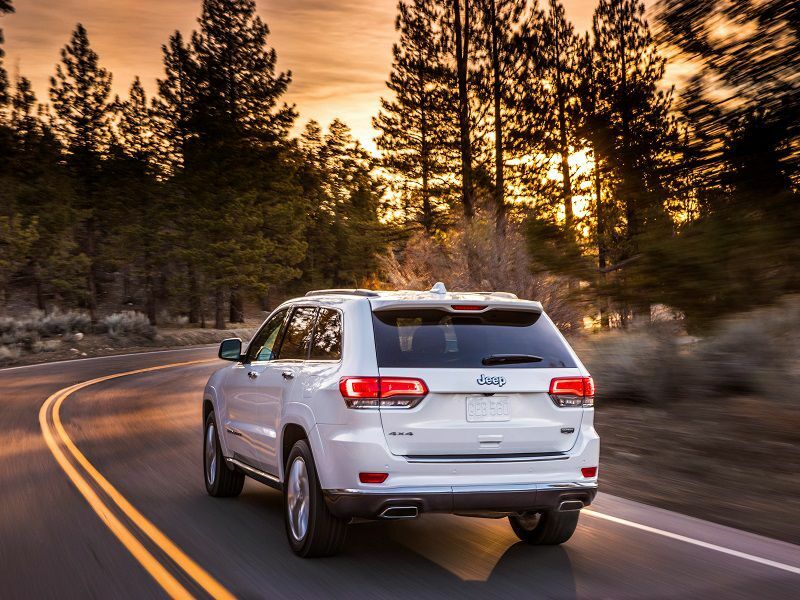 In keeping with their family-hauling missions, both the GMC Acadia and Jeep Grand Cherokee can be equipped with an impressive array of active safety features. The Grand Cherokee offers electronic stability control, electronic roll mitigation, all-speed traction control, brake assist, and four-channel antilock brake system. 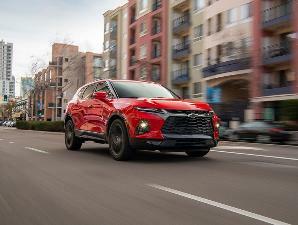 Forward collision warning and an automatic parking system are standard on some trims, and optionally available on others. The Acadia offers driver’s aids in two separate packages. The first has Lane Change Alert with Side Blind Zone Alert, Rear Cross Traffic Alert, and Rear Park Assist. Driver Alert Package II, standard on upper trim levels, includes Side Blind Zone Alert with Lane Change Alert, Low Speed Forward Automatic Braking, front pedestrian detection, IntelliBeam automatic headlamp control, Front and Rear Park Assist, Rear Cross Traffic Alert, Lane Keep Assist, Following Distance Indicator, Forward Collision Alert, and Safety Alert Driver Seat. 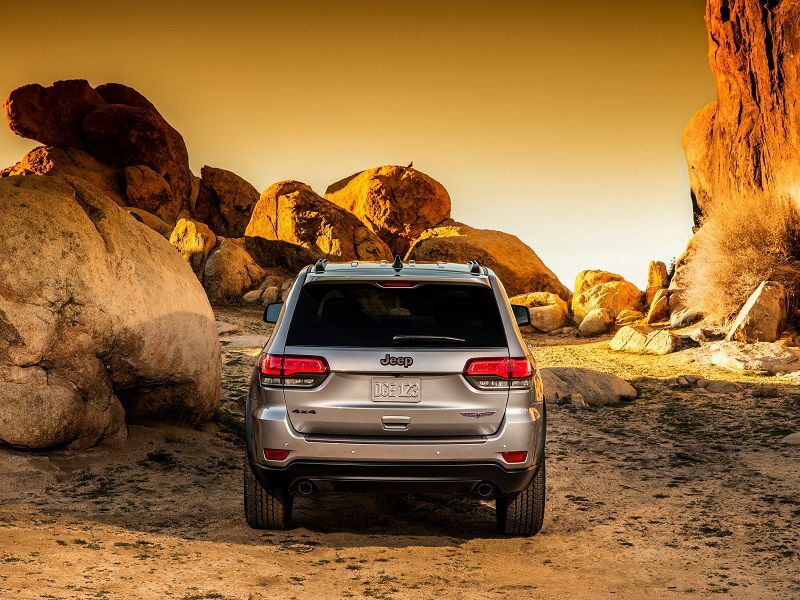 When equipped in the proper configuration, the Grand Cherokee is the most capable off-roader in its segment. While negotiating the Rubicon trail in many competitors would be a struggle, the Grand Cherokee’s lithe shape and well-honed off-highway prowess will make the journey a pleasant one. At the same time, if you want an on-road warrior with truly impressive performance, the Grand Cherokee SRT offers just that. The Trackhawk pushes the envelope still farther. In comparison, the GMC Acadia offers neither the off-road capabilities of a Grand Cherokee in Trailhawk trim, nor does it offer the truly exhilarating performance of the SRT. But it does offer pleasant suburban transport for your family. Not a canyon runner, but the Acadia makes highway miles disappear into the rearview mirror with ease. As we have noted, the Grand Cherokee trades off some interior and cargo room for enhanced off-road abilities. 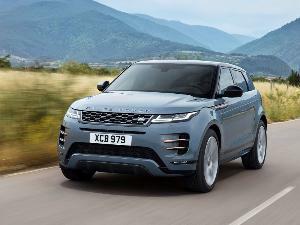 It offers 140.5 cubic feet of interior space (cargo and passenger room). With the rear seats in use, it has 36.3 cubic feet of cargo area behind the rear seat backs. With the rear seats folded, the Grand Cherokee has 68.3 cubic feet for cargo. 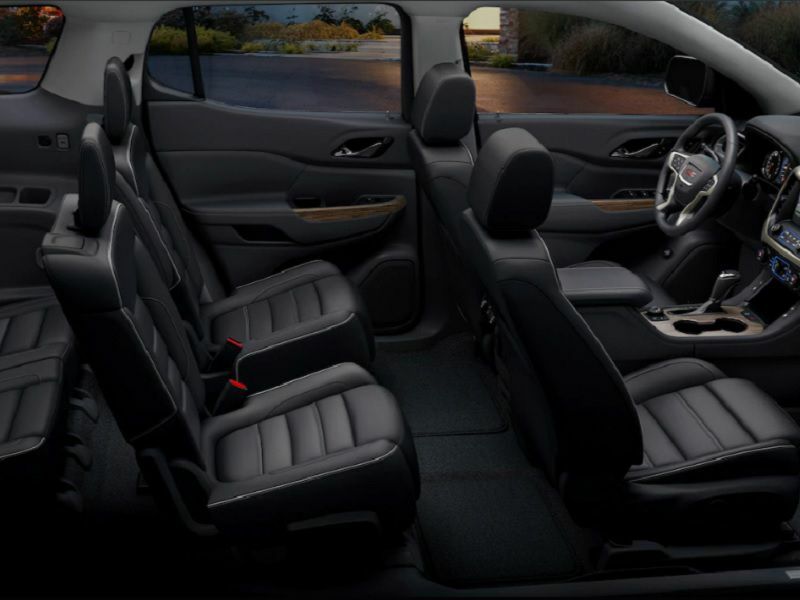 The GMC Acadia offers a slightly larger amount of interior space at 143.8 cubic feet for total interior volume. With the second-row seats in use, it has 41.7 cubic feet of cargo space behind the seat backs. 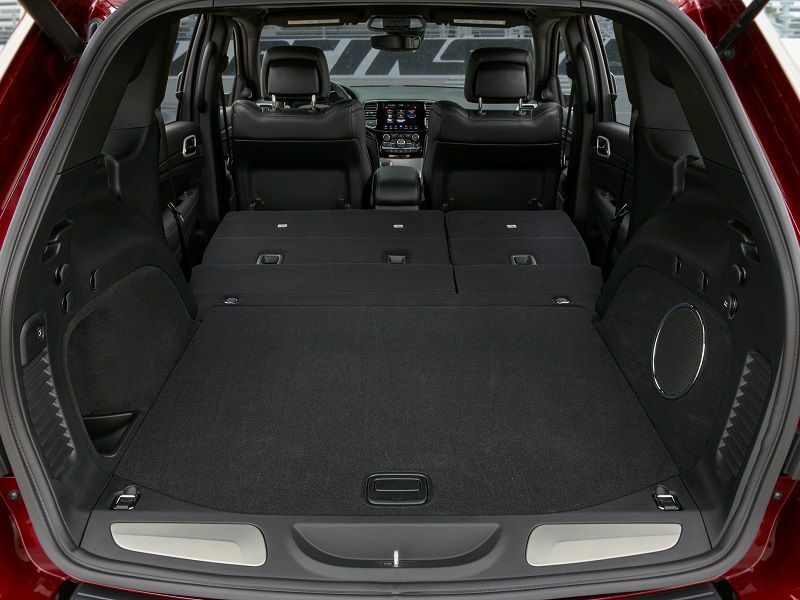 With all the rear seats folded, the Acadia has 79.0 cubic feet of cargo area, and even with all three rows in use, it offers 12.8 cubic feet behind the third-row seat backs. The Grand Cherokee offers maximum towing of 7,400 pounds. 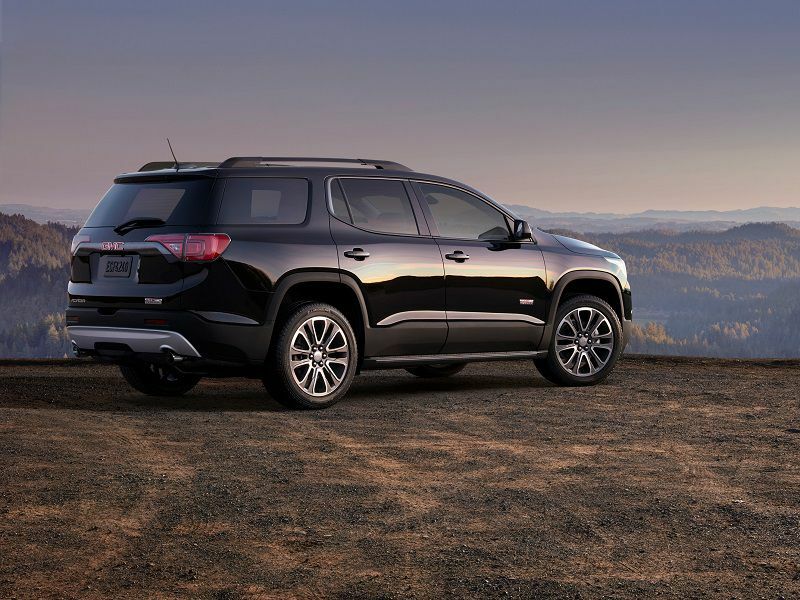 The GMC Acadia has a maximum towing capacity of 4,000 pounds. When it comes to fuel economy numbers, the GMC Acadia outdoes the Jeep Grand Cherokee, but it is difficult to make an apples-to-apples comparison. With the 2.5-liter engine, the front-drive Acadia has EPA ratings of 21 mpg city/26 mpg highway/23 mpg overall, while the all-wheel-drive version has EPA ratings of 21 mpg city/25 mpg highway/22 mpg overall. The Acadia V6 has an EPA rating of 18 mpg city/25 mpg highway/21 mpg overall in front-drive form, and all-wheel drive is 17 mpg city/25 mpg highway/20 mpg overall. The most fuel-efficient of the Grand Cherokees is the V6 rear-drive version, with EPA ratings of 19 mpg city/26 mpg highway/22 mpg overall. A four-wheel-drive Grand Cherokee with the base 3.6-liter V6 engine delivers 18 mpg city/25 mpg highway/21 mpg overall. The Grand Cherokee SRT gets 13 mpg city/19 mpg highway/15 mpg overall, and the high-horsepower Grand Cherokee Trackhawk is rated 11 mpg city/17 mpg highway/13 mpg overall. he base front-drive Acadia has an MSRP of $29,000 with destination included. A mid-level all-wheel-drive SLE model has a starting price of $37,200, and the heavily equipped and distinctively styled all-wheel-drive Acadia Denali has an MSRP of $45,500. 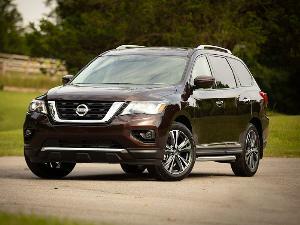 Both SUVs in this comparison are satisfying vehicles, but they also are very different. For many, the GMC Acadia with a base price of just over $29,000 and three-row seating is the superior choice as an everyday family transport vehicle. On the other hand, the Jeep Grand Cherokee does an excellent job balancing its off-road capabilities with very satisfying on-road manners. And the GMC Acadia has nothing that approaches the performance level of the SRT or Trackhawk. So it really comes down to what you value. 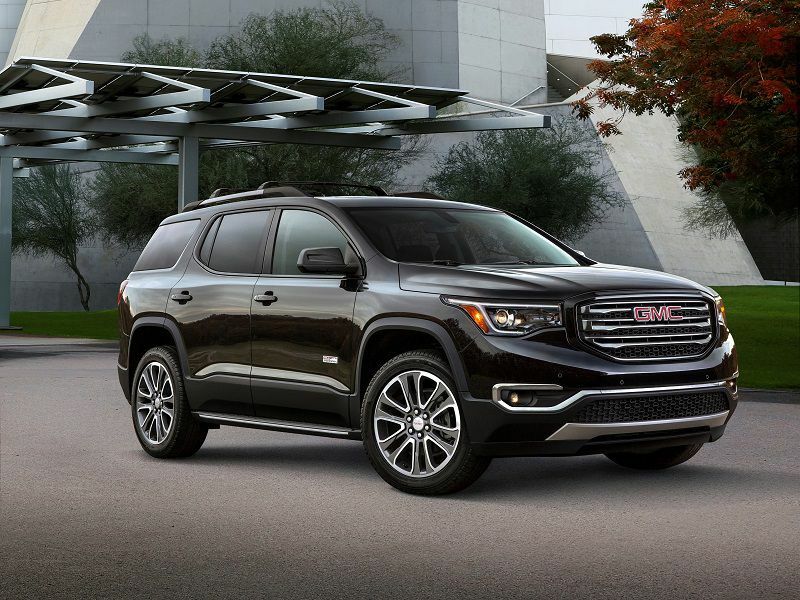 If you need more than five-passenger seating, the GMC Acadia is the clear choice, but in this comparison, it’s hard not to reward the versatility of the Jeep Grand Cherokee.